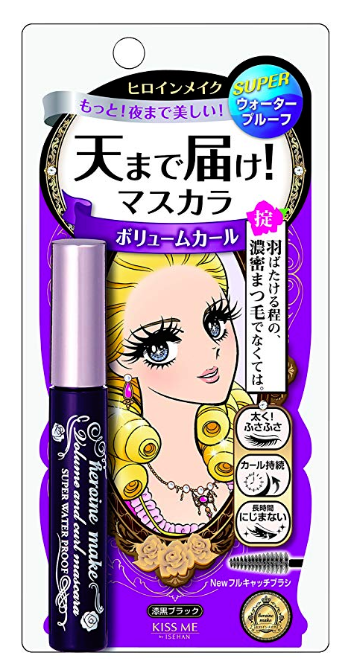 Everyone is talking about this Japanese mascara that apparently is better than false lashes. If it's really good, it's going to be from far away. That's the rule. It's probably going to be expensive, too, and, even if you can afford it, it will likely be sold out. Then, if it's one of those 'holy grail' hero products that happens to be cheap, they'll be absolutely nowhere to be found. This, friends, is not the case (apart from it being from a distant land). Another 'false-lash' worthy mascara we wrote about is Wet n Wild's Lash-O-Matic; read about it here. This mascara from Japanese company Isehan is apparently the absolute bee's knees of mascaras. According to Glamour, beauty fans are loving it claiming that it doesn't move all day, doesn't clump or flake and it does what it says on the packaging. If you can't read Japanese, don't worry! The name of the mascara is on the mascara itself. It's called 'Heroine Make Volume Curl and Mascara', and that's apparently what it does. The New York Magazine even wrote about this, saying that it's the blackest mascara they've ever used and confirmed that it's almost impossible to remove without actual eye-makeup remover. Another very enthusiastic review said: This shiz straight up defies gravity. Two minutes ago, I had the lashes of an amoeba. Now, I'm walking around my house, batting my heavily fringed eyelids à la Catherine Zeta-Jones in a corset with a quivering sword, like Scheherazade as depicted in that 19th-century painting. Lashes today, Pulitzer Prize tomorrow. It's the natural progression of things." Mmm, kay. But we're just a little bit convinced. You can get it on Amazon and try it for yourself (prices are in pounds but they deliver to Ireland). If you do, make sure to let us know if the rumours are true!